CIRM has appointed an international Scientific Committee to oversee all scientific decisions. Click on the button above to discover its members. At any one time, the team at CIRM oversees the organization of around 100 large conferences and research schools, as scientific calendars are planned on average two years before events take place. These workshops, where new advances are made and new ideas are discussed, focus on all areas of mathematics and involve the scientific and economic sectors that benefit from mathematical research and developments. To advertize events widely and share crucial information for a successful running of the events, CIRM has chosen to focus on a very professional presentation of each event through the use of dedicated webpages in French and English. This increases communication on all our activities and ensures that organizers are offered quality tools to advertize their event. Events webpages are linked to CIRM's general websites (in French / in English) through the calendars of events. Furthermore, the international coordinator makes sure information is posted on international platforms such as the AMS calendar, ERCOM calendar, EMS website, etc. To generate a fully international environment at all levels, Cirm also insists on the fact that events with a large international outreach should have an international organizing team. It also strongly encourages Jean-Morlet Chair holders to look for co-funding from abroad and this has been successful with sponsorship from the National Science Foundation, the Clay Mathematics Institute, the European Mathematical Society, CRSNG Canada, etc. Created in 2013, this Chair was named to honour the memory of Jean Morlet, an engineer who worked on the discovery of the theory of wavelets - a tool that was used to later develop the JPEG 2000 standard, among many other developments. Morlet worked with a group of scientists, some of them based in Marseille and many meetings of the group took place at Luminy. 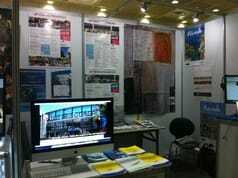 This programme has quite a precise and demanding road map, with a range of compulsory events to organize. It has met with great international success. Sixteen semesters have already been awarded and selection takes place two years before the start of a semester. Participants in events linked to a Chair semester come from all over the world and it is not rare to see 80% foreigners among the visitors! In one of its evaluations of the Labex CARMIN initiative, the French National Research Agency commented on the high quality of this project and on its novelty aspect. Quality can also be observed in the funding that the Chair has attracted. 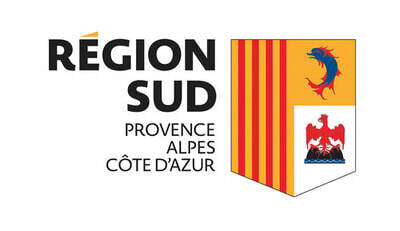 Alongside original sponsors and partners in this programme (Aix-Marseille University, CIRM, City of Marseille) other sponsors co-fund many of the semesters. For example, one of the highest contributors has been the American National Science Foundation, supporting the participation of US-based researchers in many of the events. The Clay Mathematics Institute has also been a regular, generous sponsor. 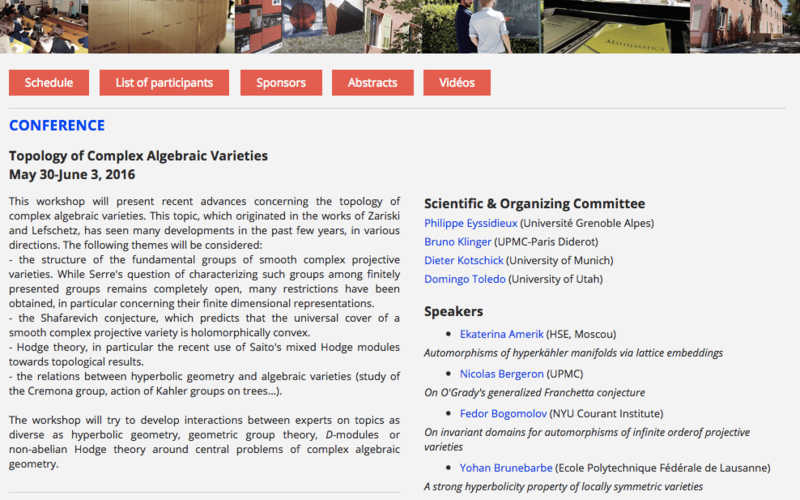 This Chair also contributes to creating a good synergy between the various Marseille mathematical departments and, as such, plays an indirect part in the very good position granted to Aix-Marseille "Mathematics" in world rankings. Our aim is not only to present the centre's own new developments but also to be a driving force representing French mathematics as a whole. 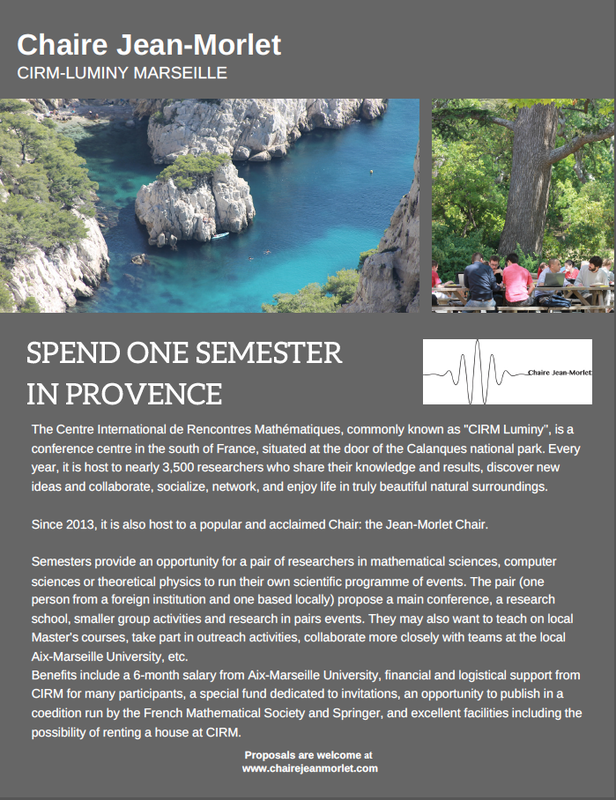 By being physically present on a stand during the various congresses or by networking with others, we can advertize many sides of CIRM and of its trustees (the CNRS - and in particular its Maths Institute, INSMI - the French Mathematical Society, and Aix-Marseille University). We can also present common projects that are run with Labex ARCHIMEDE and CARMIN (such as our Audiovisual Library) and communicate on the success of mathematics undertaken in France. 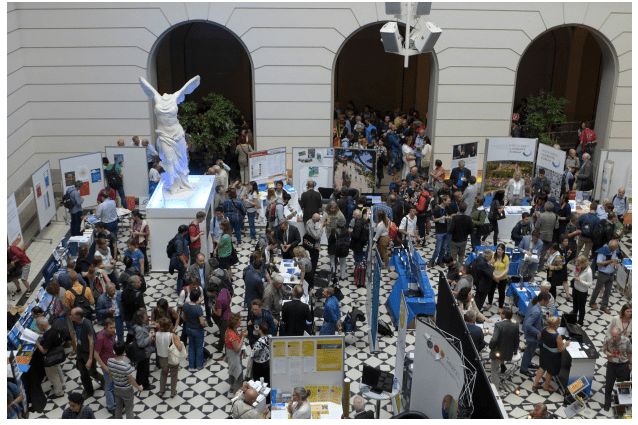 It is for us an opportunity to reach a larger public of researchers and to be a showcase for Luminy, the City of Marseille, the Region of Provence and much further! In order to share our attendance in those incredible events, we bring it directly to our followers through a blog co-written by the staff onsite at the congress (International Officer / Director) and staff at CIRM (Communication Officer). CIRM also participates dynamically in the consortium and think-tank "ERCOM" (European Research Centers On Mathematics) which focuses on European scientific policy in mathematics. Since 2015, the Director of CIRM is Vice-President of ERCOM. CIRM travels to sites to get inspiration from the best centres in the world, which are of course our competitors but are also our collaborators. In return, CIRM is also seen as a model centre in many areas, and several prestigious institutes have sent staff to Luminy for site visits. All in all, this contributes to closer relations and stronger collaborations between the ERCOM centres, and to improving facilities for users in all European centres. Within the framework of the French Laboratory of Excellence initiative "Labex CARMIN", CIRM has been a very dynamic driving force in scientific film production. It is today world leader in quality mathematics films that are post-edited with the addition of chapters and key words. Over 1000 videos are altogether accessible via our own online Audiovisual Mathematics Library and there are close to 20,000 monthly views (Youtube CIRMchannel). We are very keen to disseminate the top quality, current, international research that we witness each week towards the whole world.